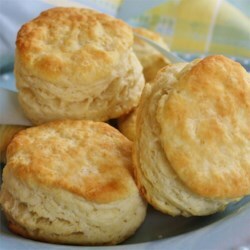 This is definitely my go-to recipe for biscuits. They turn out perfectly every single time, and people beg me to make them. Don't knead the dough though, as this makes it too tough. Just is it enough to incorporate the ingredients well, and then handle the dough as little as possible to keep the biscuits super light and fluffy. Give this recipe a try- you will not be dissapointed!